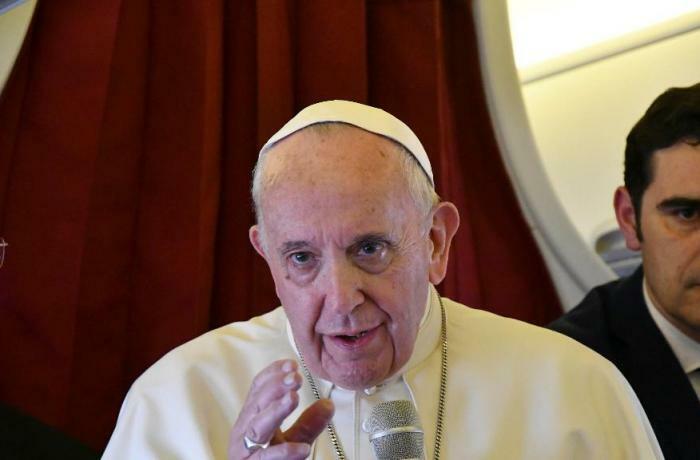 VATICAN Pope: coexistence with Muslims "is a beautiful flower that promises to bear fruit"
Interreligious dialogue, walls that will imprison those who build them, populism, welcoming migrants, freedom of conscience, some of the themes touched on by Francis in his conversation with journalists during the return flight from Morocco. Vatican City (AsiaNews) - Coexistence between Christians and Muslims "is a beautiful flower that promises to bear fruit. We must not give up!” knowing that“ there will still be difficulties, many difficulties because unfortunately, there are intransigent groups ”. 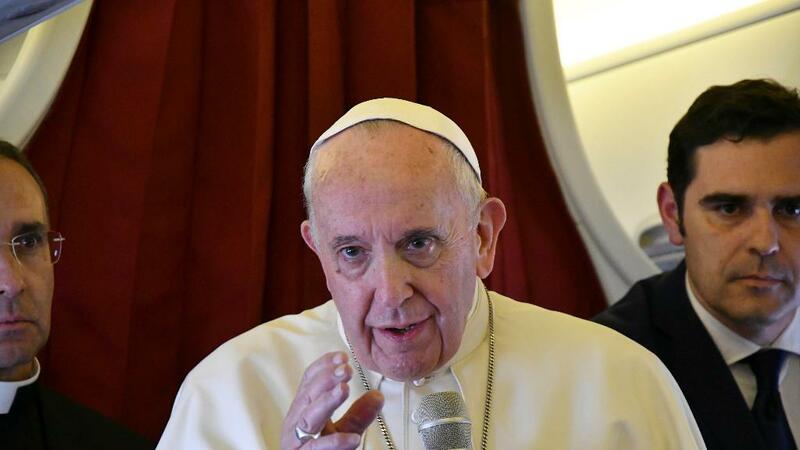 Pope Francis confirmed his belief in dialogue on his return from Morocco, a country where "there is freedom of worship, there is religious freedom", in speaking with journalists during the flight back to Rome. He also said that "now we see the flowers, the fruits will come later. But the flowers are promising ”. Always, “when there is a fraternal dialogue, there is a relationship at various levels". "For example: the joint appeal for Jerusalem was a step forward made not by an authority of Morocco and an authority of the Vatican, but by believing brothers who suffer seeing this" City of hope "that is not yet as universal as we all desire it to be: Jews, Muslims and Christians. We all want this. And this is why we have signed this desire: it is a desire, a call to religious fraternity that is symbolized in this city that is all ours. We are all citizens of Jerusalem, all believers ”. "With Muslim brothers and sisters, we sealed this fraternity in the Abu Dhabi document, and here in Morocco, with this we have all seen a freedom, a welcome, all brothers with such great respect.” "We have seen that it is better to sow hope, to go hand in hand, always ahead". In Morocco, he said, we have seen, "even in the dialogue we need bridges and we feel pain when we see people who prefer to build walls. Why do we feel pain? Because those who build walls will end up being prisoners of the walls they have built ”. He later went on to say "but something else is concerning to me: the regression of us Christians when we take away freedom of conscience. Think of the Christian doctors and hospital institutions that do not have the right of conscientious objection, for example, for euthanasia. How? The Church has moved on and you Christian countries go backwards? Think of this because it is a truth. Today, we Christians have the danger that some governments will take away our freedom of conscience, which is the first step toward freedom of worship. The response isn’t easy. But, let’s not accuse Muslims. Let’s accuse ourselves also in these countries where this happens. It is a shame.". The issue of walls that will make prisoners those who build them is a concept that Francis repeated speaking of populism and migrants. Responding to a journalist who had pointed out to him that in Morocco, Spain has built a wall with blades, "First of all - he replied - First of all, what I said a moment ago, the builders of walls, whether made of barbed wire that cuts with knives or bricks, will become prisoners of the walls they make. First. History will show this.”. And when they showed him the images of that wall, " I cried. I cried because so much cruelty doesn’t enter into my heart and my head. Watching people drown in the Mediterranean doesn’t enter into my heart and my head, blocking ports doesn’t enter. This isn’t the way to solve the grave problem of immigration. I understand, a government with this problem has a “hot potato” that needs to be resolved in another way. When I saw that wire, with knives, It seemed like I couldn’t believe it. Then, once I had the chance to see a video of the prison of refugees that return, that are sent back.” “I do not let them in, or let them drown there, or send them away knowing that so many of them will fall into the hands of these traffickers who will sell women and children, kill or torture to enslave men.”. "Do not let them enter, or let them drown there, or send them away knowing that so many of them will fall into the hands of these traffickers who will sell women and children, kill or torture to enslave men?" "I see that many people of good will, not only Catholics, but good people, of good will, are a little gripped by the fear that is the usual sermon of populism: fear. Sowing fear and then making decisions. Fear is the beginning of dictatorships." As was the case in Germany when Hitler arrived. "It is true that the first work we should make is to try to ensure that people who migrate for war or for hunger do not have this need. But if Europe, so generous, sells arms to Yemen [used] to kill children, how can Europe be coherent? I say: this is an example, but Europe sells weapons. Then there is the problem of hunger, thirst. Europe, if it wants to be the mother Europe and not the grandmother Europe, must invest, must try intelligently to help to lift up [people] with education, with investments, (this is not mine, Chancellor Merkel said it). It is something that she carries forward well enough. To prevent immigration not by force, but by generosity, educational investments, economic investments, etc. This is very important. Second thing about this: how to act. It is true that a country cannot receive everyone, but there is all of Europe to distribute migrants to, there is all of Europe. Because hospitality must be open-hearted, then accompany, promote, and integrate. If a country cannot integrate [migrants] it must immediately think of speaking with other countries: how much you can integrate to give a dignified life to the people."